Parliamentarians from jurisdictions around the world today added weight to calls for greater transparency in the international tax system. Twenty-six Parliamentarians have now signed a concordat calling on governments to support greater tax transparency by multinational companies. The latest signatories were in London for today’s Global Tax Transparency Summit, hosted by the Committee of Public Accounts and attended by delegates from jurisdictions with a combined population of more than two billion people. Central to the concordat is an agreement on support for public ‘country-by-country reporting’ to show, for each tax jurisdiction in which multinationals do business, their revenue; their profit before income tax; the income tax paid and accrued; total employment; capital; retained earnings, and tangible assets. Jurisdictions represented at the summit were Australia, Bangladesh, Belgium, Bermuda, British Virgin Islands, Bulgaria, Canada, Cayman Islands, Czech Republic, Denmark, France, Germany, Guernsey, India, Ireland, Isle of Man, Israel, Jersey, Kenya, Madagascar, Mexico, Moldova, Niger, Norway, Pakistan, Poland, South Africa, Spain, Switzerland and the UK. Delegates also took part in four plenary sessions examining global tax transparency, action to combat tax avoidance, efforts to drive change in the international tax system and the impact of tax avoidance on the developing world. “Tackling aggressive tax avoidance and increasing transparency requires sustained cooperation across international borders. The excellent support for today’s summit, organised and hosted by our Committee, highlights the strength of feeling on these issues and represents an important step towards addressing them. We have agreed some strong themes to explore in future and more Parliamentarians have signed the open letter to our governments, urging greater transparency of multinationals’ profits and tax. Our Committee’s work scrutinising government spending, and that of colleagues overseas, is always better when information is in the public domain and civilians can help us hold governments to account. We want the same opportunity for people to scrutinise the tax affairs of multinational companies. Businesses should behave like good corporate citizens and pay their fair share of taxes; no business should expect to avoid its duties to wider society without genuine anger from the public. As Parliamentarians we must now keep up the pressure on our governments to commit to more transparent reporting on multinationals. We have no desire to set up a whole new bureaucracy but we must be fleet of foot to deliver the action our citizens are increasingly demanding. Good news this week from Tax Inspectors Without Borders, who announced this week that their four pilot projects to build capacity with developing nations’ revenue inspectors had netted more than $200m extra tax revenues. Tax Inspectors Without Borders is a project backed by the United Nations Development Programme and the OECD. Both are now hoping to roll out the project to more countries. We recently did a podcast on the initiative, the link can be found below. 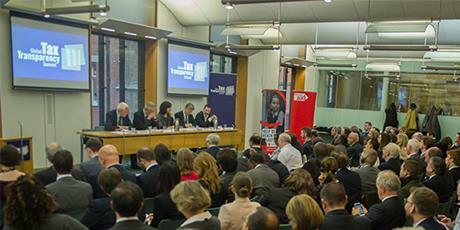 On Friday, Parliamentarians from around the word met at the Global Tax Transparency Summit, hosted by the UK Parliament’s Public Accounts Committee. The outcome of the summit was to support a call for greater tax transparency from multinational companies. The summit was attended by parliamentarians from over 20 countries, including some well known tax havens like the BVIs, Isle of Man and Cayman Islands. Clearly, having politicians from some of these havens of secrecy joining the call is good news. Lets hope it leads to some positive action. So lets hope all this positive news carries through into next week, when LuxLeaks whistleblower Antoine Deltour begins his appeal against his conviction for stealing corporate information from PwC. Given that the information demonstrated how the firm was helping multinationals to avoid their tax obligations, the public interest in this case was obvious. However, the Luxembourg court still sentenced Deltour and another employee, Raphael Halet to a suspended jail sentence. More information on how to support Antoine can be found here. The introduction of a key policy tool against multinational companies’ tax avoidance has been handled so badly that developing countries are now exposed to worse inequalities. In a new report published today, we call for immediate changes to limit the damage done. In 2003, the Tax Justice Network outlined an important new policy for transparency […] The post For rich countries only: A global map of multinationals’ tax avoidance appeared first on Tax Justice Network. On July 22nd, 2016 the French supreme constitutional court ruled on a case brought by a US American citizen resident in France who had created a trust, allegedly to distribute her inheritance. She was contesting moves by France to set up a public register of trusts connected to France in an attempt to tackle tax […] The post Beneficial Ownership and disclosure of trusts: challenging the privacy arguments appeared first on Tax Justice Network. Listen to news on Tax Inspectors Without Borders in our November 2016 podcast, here.